AMA Received MSME Conclave Award! 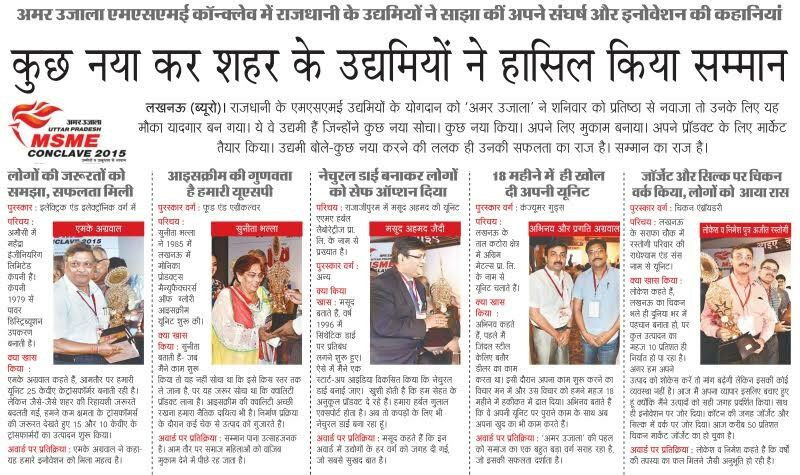 U.P Chief Minister Mr. Akhilesh Yadav and Union Minister Mr.Kalraj Mishra have given the Amar Ujala Uttar Pradesh, MSME Conclave 2015 award to Mr.Yawer Ali shah CEO and Co- founder of AMA Herbal Laboratories Private Limited for creating a safer option for the people by developing ‪‎natural dyes‬. The MSME included 17 categories awards for the selected 49 industrialists and comprised 5 specialized categories awards. On the event Mr.Yawer Ali Shah said-“ We had developed a startup idea for manufacturing natural dyes in the year 1996 when ban on synthetic dyes had been started. I am feeling happy and having privilege to provide people friendly ‪#‎products‬. However, our Natural Herbal Gulal or Colour Powder has been exported worldwide. And now we are making Natural Textile Dyes for the clothes as well.